This is a beautiful, turquoise and adobe brown, deeply etched vase created by Navajo Izach Joe who belongs to the Navajo Tribe. It is 8" tall and 6" wide and is signed by the artist, whose photo is included. Shipping is free. This Horse Hair pottery was created and signed by Ronald Smith of Farmington, New Mexico. Pottery is 8 inches x 5.5 inches. Photo of artist is included. Shipping is Free. 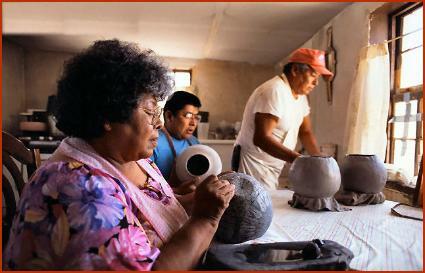 BEAUTIFUL Etched pottery was created and signed by Freddie Smith of Kirkland of New Mexico. Pottery is 7 1/4 inches x 4 inches. Photo of artist is included. Shipping is Free.